In 2016, even after manually adding the necessary registry key, the add-in does not load. Interactive Guide - Opens a browser and displays the Interactive Ribbon Guide. This is a visual, interactive guide to help you find your 2003 commands in 2007. Up to Speed with Excel 2007 - Opens a browser and displays an online course to help you learn how to use Excel 2007. Excel 2007 Overview - Opens a browser and lets you watch videos showing you how to get the most out of this version. Get Up to Speed with Excel 2007 - Opens a browser and displays a list of whats changed, whats new and whats better in 2007. Discuss Excel 2007 - Opens a browser and takes you to the Excel Online community forum. Training - Opens a browser and displays the training homepage. Video Demos - Opens a browser displaying a list of demonstration videos. 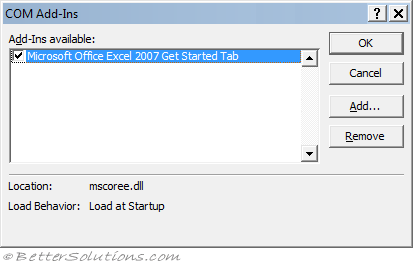 Excel 2007 - Opens a browser window letting you explore the full range of help and how to information.